This week’s question comes from Carri. 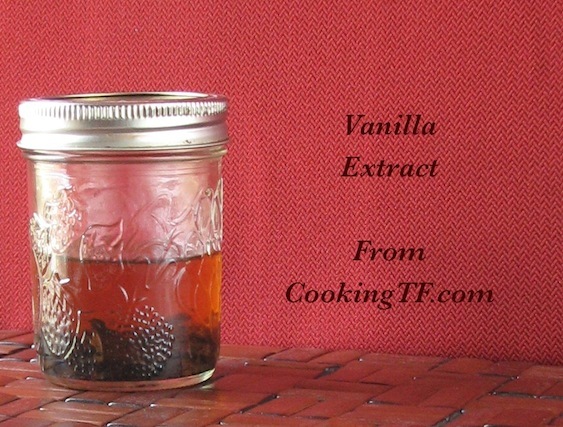 Do you make your own vanilla extract? How? Carri, I do make my own extracts. It’s a simple, quick process that saves a lot of money. Because we are gluten-free, I use either a triple-distilled vodka or a potato vodka. The triple-distilled is cheaper but the potato vodka is an extra measure of safety, especially if you’re highly gluten-sensitive. I start a batch of vanilla extract and then keep the bottle topped off. I’ve been able to stretch two beans into a quart of vodka or more this way. This becomes highly economical as I can produce a quart of vanilla extract for about the cost of one 8-ounce bottle in the store. If you can use any vodka, you can make it considerably cheaper. Some people instead choose to use up all of the alcohol and then put another two cups in and allow it to soak for two or three months. Since it takes me several months to go through a quart, the regular topping off works well for me because the beans have a long period of time to soak. Cut the vanilla bean in half lengthwise, and cut each piece into 2-3 pieces. Place in a small mason jar. Add the vodka to cover. Allow to sit, shaking occasionally, for 6 weeks. Vanilla is now ready for use, you do not have to remove the beans as long as they stay submerged in the vodka. As you use the extract, add more vodka to the bottle until you notice the strength of the flavor is beginning to diminish. Then use up what you have and start over again. This post is part of Make Your Own Monday. Hello !! You have a great page. My question is about making the vanilla extract without alcohol. Do you have a substitute ? Thanks in advance. Mohamed, I’m not sure how to do it without alcohol. You could try glycerine instead and let it sit for longer, but it would make the mixture very sweet so you would need to reduce the amount of sweetener in your recipe to compensate. It would also make whatever you are making more moist since glycerine is a humectant. You’re the only other person I’ve heard of who is sensitive to grain-based vodka like I am! (I have Celiac, too.) Could you tell me which brand of vodka is potato-based? I haven’t found it yet. I’ve been using rum for all tinctures, but I worry about the sugar cane being GMO. Laura, I’ve never tried other alcohols, I just do it as a precaution since we do have celiac. The potato vodka I’ve used in the past to make vanilla extract was Luksusowa. It’s a very good precaution that I wish I had known to take after I was first diagnosed (big ouch) and was still learning where gluten is hidden. Do you know if it is possible to make it without using alcohol and something els in its place? Thanks! I’m not sure how to do it without alcohol. You could try glycerine instead and let it sit for longer, but it would make the mixture very sweet so you would need to reduce the amount of sweetener in your recipe to compensate. It would also make whatever you are making more moist since glycerine is a humectant. I’ve seen this around the holidays and just need to get myself to splurge and buy some vanilla bean extract. This is a great idea!